I Skate, Therefore I Am: Skateboard as an Art. 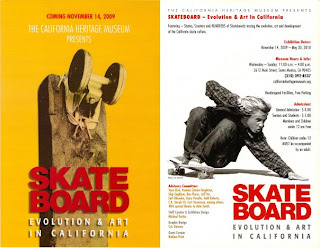 The California Heritage Museum is proud to present “SKATEBOARD: Evolution and Art in California.” The show opens to the general public on Saturday, November 14, 2009 and continues through Sunday, May 30, 2010. More than 275 rare boards from the world’s finest collections including Jason Cohn, Dale Smith/Skate Designs Inc., Todd Huber/Skatelab Skatepark, Ray Flores, James Lang/South Bay Skates. Additional lenders included are Kevin Anderson/Model Worm, Art Brewer, Terry Campion, Cris Dawson, Deluxe Distribution, Earl, Skip Engblom, Craig Fineman, Wayne and Donna Gunter/Surfing Cowboys, Mike Horelick/Tunnel Skateboards, Chuck Katx, Mike Kolar, Gordon McClelland, Jim McDowell/RIPWynn City Skates, Marc McKee, Aaron Murray, James O’Mahoney/Santa Barbara Surfing Museum, Nathan Pratt, Mark Richards/Val Surf, Ronnie/Animal House, Steve Salyer/Pastures of Heaven, Gabriel Steptoe, Joel Tudor, Wentzle Ruml IV, Cary B. Weiss, Z-BOY Archive, and Z-CULT Skates. Photographs and art by C.R. Stecyk III, Glen E. Friedman, Craig Fineman, Wynn Miller, Kevin Ancell, Wes Humpston and more document the movement and its personalities. A full series of events, including film screenings of Dogtown and Z-Boys, Skater Dater and Rising Son: The Christian Hosoi Story, will take place at the museum and the downtown Santa Monica Library. Talks, photo exhibits, special guest appearances and autograph sessions will take place throughout the exhibit run into 2010.